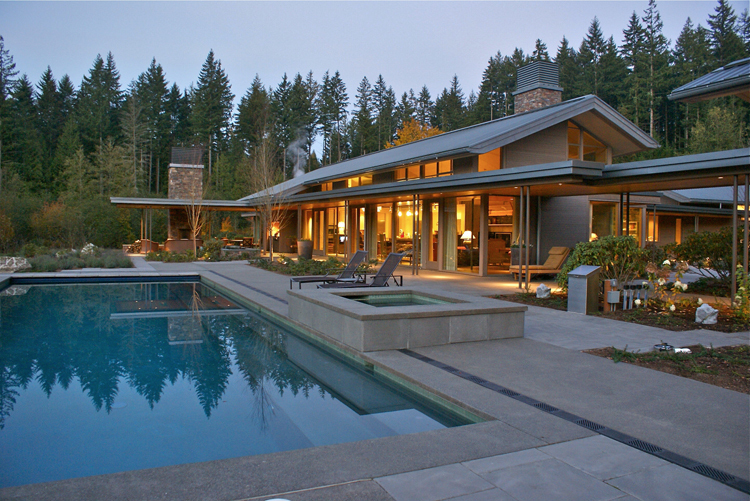 This residence integrates perfectly with the views and contours of a beloved wooded area, and overlooks a small lake. At the owner's request, the house uses a single-floor layout. Extended canopied-terrace designs and large open-roofed elements separated by glass passageways blend the interior of the home with the landscape. Hand-laid stone walls extend from the house into the landscape to compliment the projections of the large overhangs and canopy extensions. The strong horizontal sense also compliments the surroundings. The great room is organized around a large stone fireplace, with light flooding the room from windows above. The west exterior terrace features an outdoor fireplace, and an overhead canopy and heating elements allow the residents to enjoy three-season outdoor relaxation. The musical gurgle of a small pond nearby adds to the ambience. The southwest terrace features a swimming pool and is connected to a pool house with its own private terrace, small kitchen, and two bedrooms, to perfectly accommodate extended visits from friends and family. 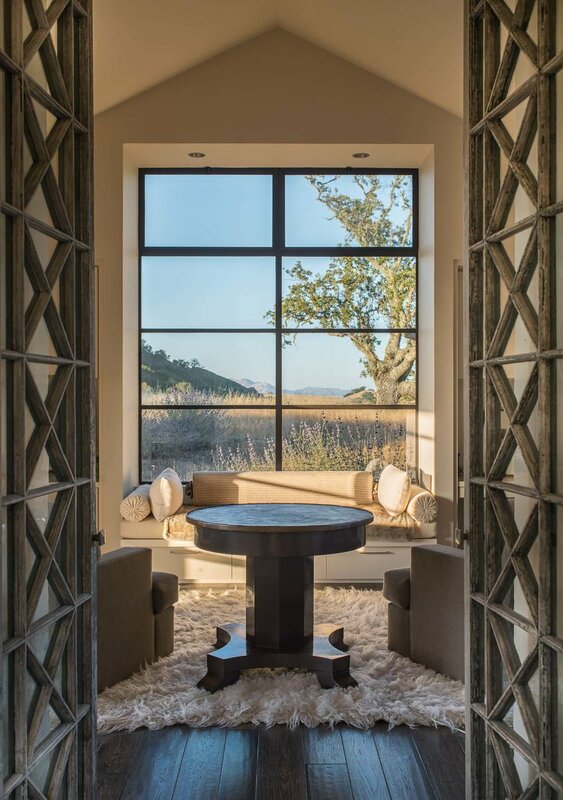 With sweeping views of the grasslands and mountains near Carmel, this Santa Lucia Preserve home is organized as a relaxed group of buildings around a courtyard and a large oak tree. Landscaping weaves in and around the structures. A main pavilion contains the living room, dining, and kitchen, while the master bedroom and bathroom occupy a smaller building at the end of the courtyard. Guest bedrooms occupy a separate pavilion which slopes over a natural grassland swale. From this grouping, a long corridor runs south to the main entry, bathroom, study, and garage. The home features pitched roofs, thick stucco walls, and muted colors, allowing the rolling mountain landscape to hold precedence. Exposed steel trusses evoke the barns and industrial buildings of an earlier era. Extended stone terraces create shaded exterior living spaces for seasonal use. 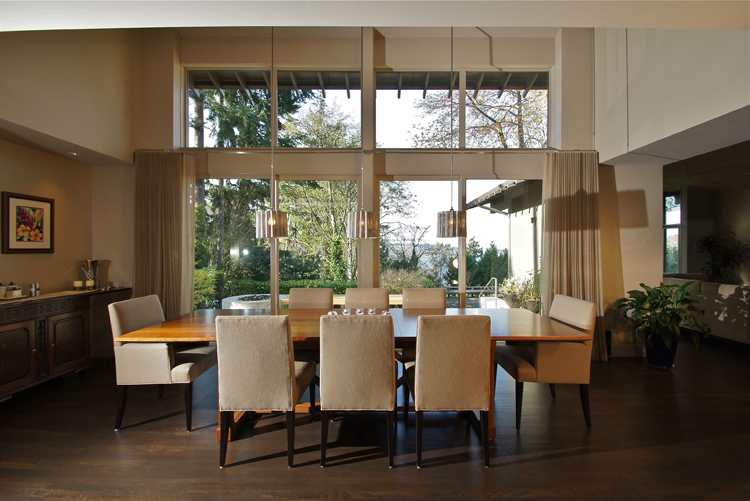 This Mercer Island home uses a single story layout featuring floor to ceiling glass that faces a forested view and covered terrace. 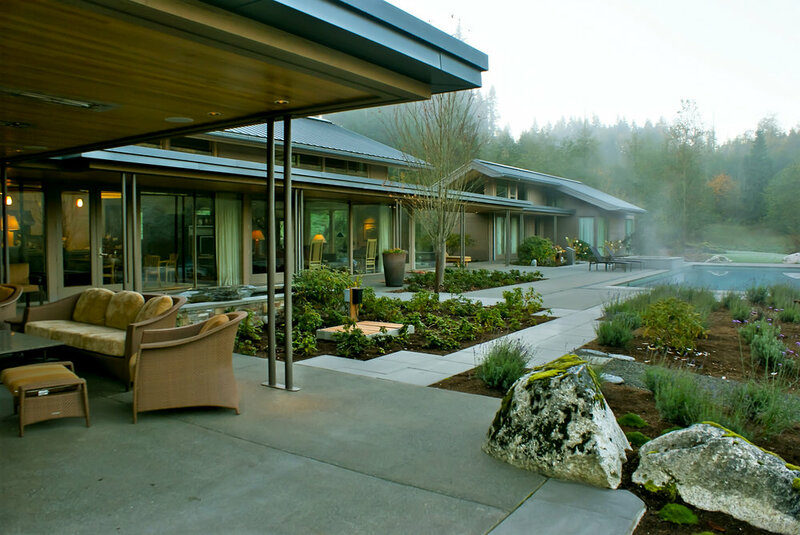 A ground level pool and outdoor fireplace enrich the lives of this active northwest family and incorporate the landscape into the home. 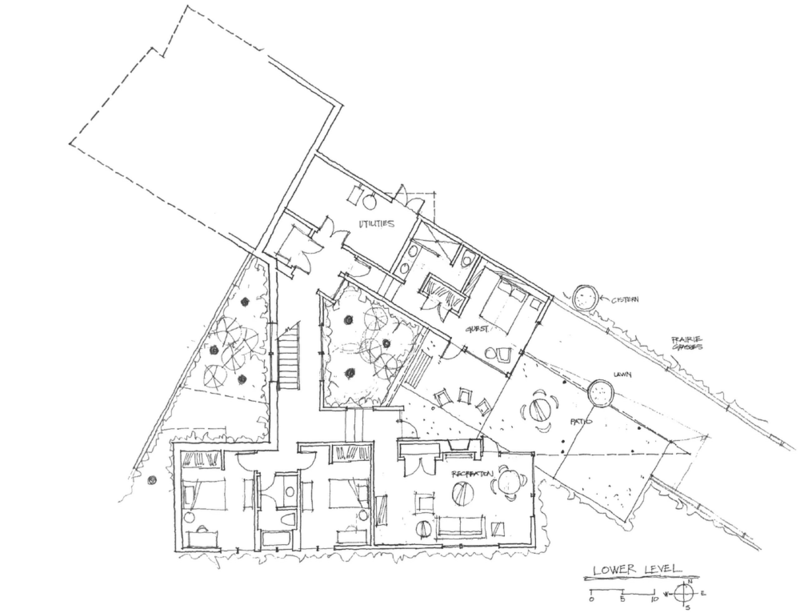 The design centers around a large and open living area and kitchen, with a bedroom wing and set-back garage on either side. The master bedroom parallels the covered terrace and includes direct patio access to the fireplace and pool. 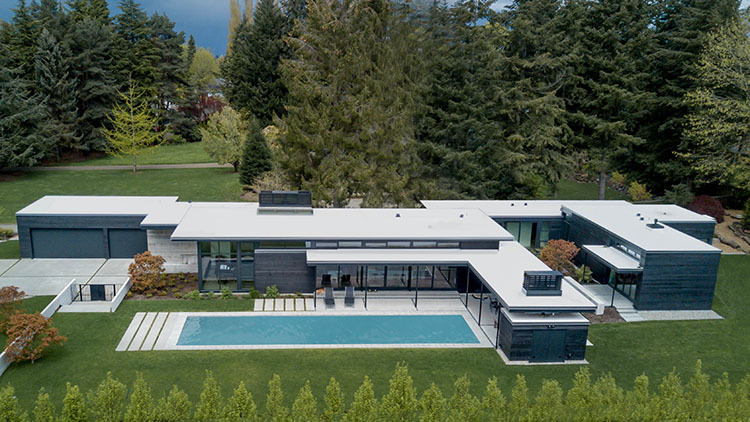 Perfect for private relaxation or social gatherings, this boldly modern home exceeds the standards of discriminating homeowners while remaining tastefully simple. 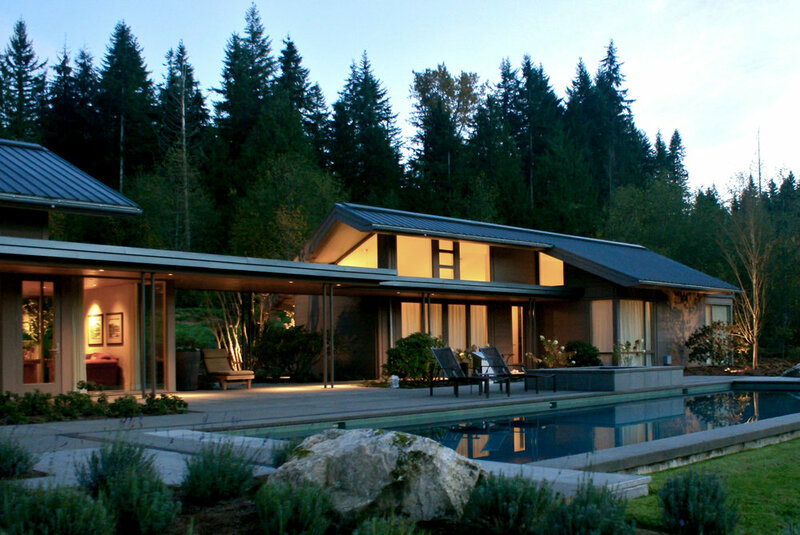 The design of this Anacortes home needed to respond to the steep, rocky slope of its site, the adjacent forest, and the panoramic views of Guemes Island and the distant Cascade Mountains. 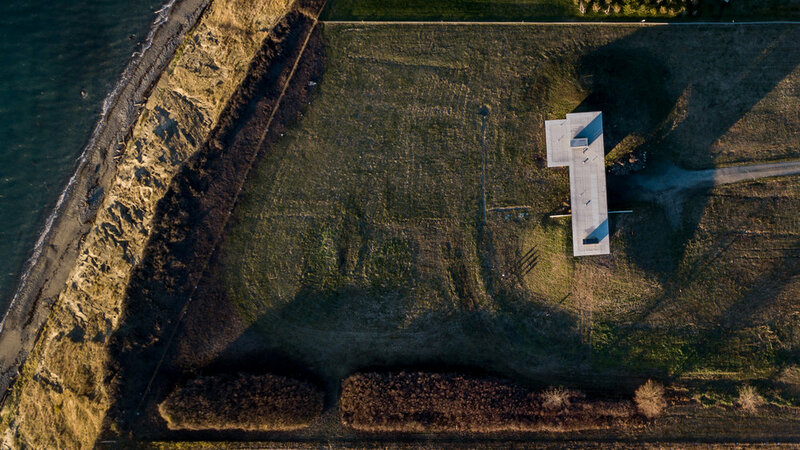 To meet these parameters, the building faces the water on one side and the forest on the other, while the layout of the building follows the topography of the land. 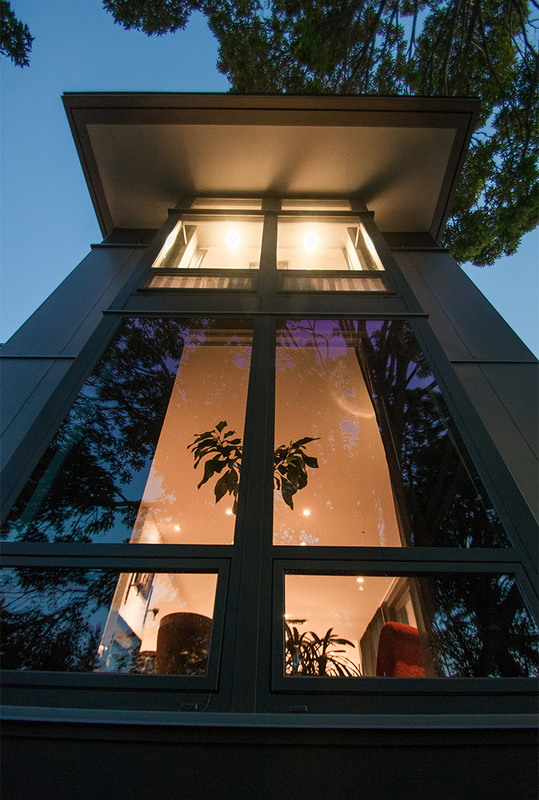 The main floor consists of two opposing wings, each with a cantilever enclosed in glass, exposing the specific views. The house consists of glulam beams and a simple shed roof. The kitchen, living and dining areas spill out onto a terrace, extending the living space outdoors. On the water side, tall windows and deep overhangs allow for plenty of natural and indirect light. 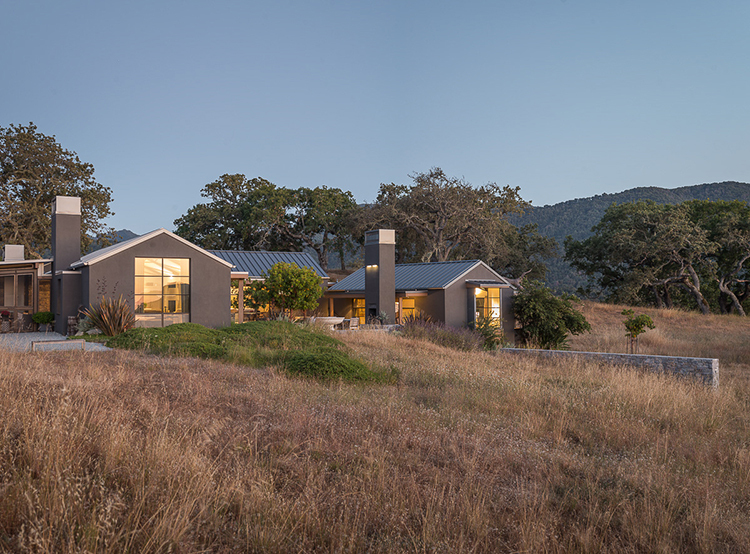 On the hill side, the clerestory windows and slope of the roof allow the southern sun to penetrate the space even on rainy, northwest days. This inner Seattle home atop Phinney Ridge features living and outdoor terrace spaces that overlook the city and distant Olympic mountains. The home is modern yet relaxed. Concrete landscape walls are interlaced with a flowing paver pattern, and a city required retention pond is now a landscape feature near the front door. Inside, a large art studio opens out onto a terrace above the garage. The kitchen, dining, and living areas are all connected as one open room, with floor to ceiling glass that illuminate the home and expand the city view. 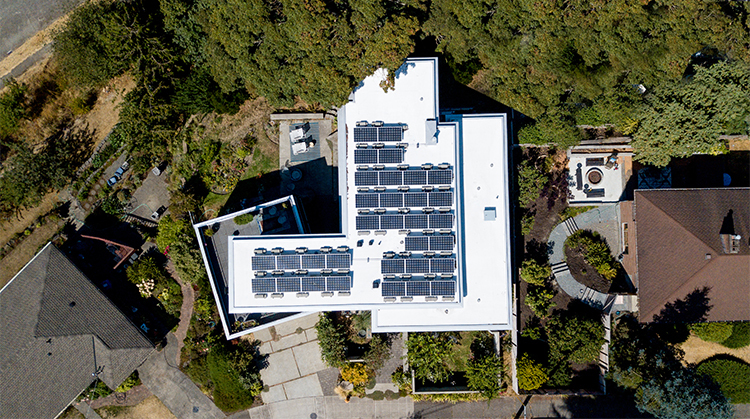 Extra insulation combined with a solar panel array atop the flat roof make the home energy efficient and renewably powered. 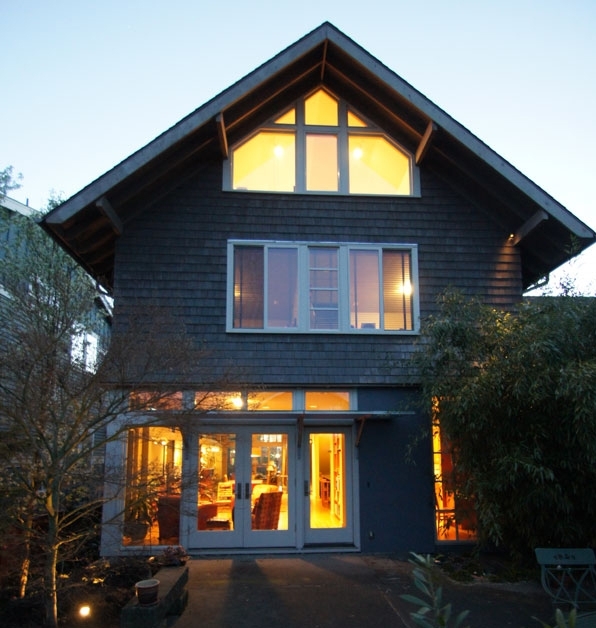 This Medina, Washington home was originally designed by by notable architect William Bain. The renovation by Soldano Luth enhances the intentions of the initial design while accommodating for the needs of the family. Additions to the home help connect the design to the landscape as well as open up the interior spaces for better connectivity within the home. A new bird's nest loft for the owners' study, accessed by a steel bridge and staircase add both functionality and elegance to the interior design. 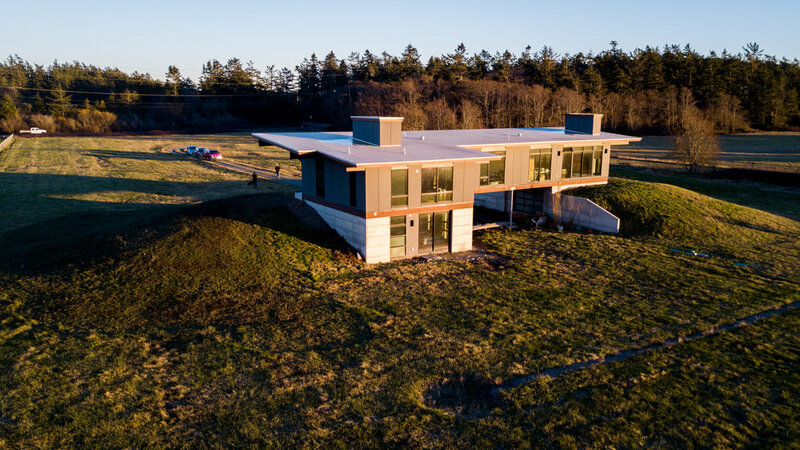 Innovative and modern, this Whidbey Island bluff home takes full advantage of its panoramic view. Cut into a small hill, the design utilizes space without intruding on the landscape. 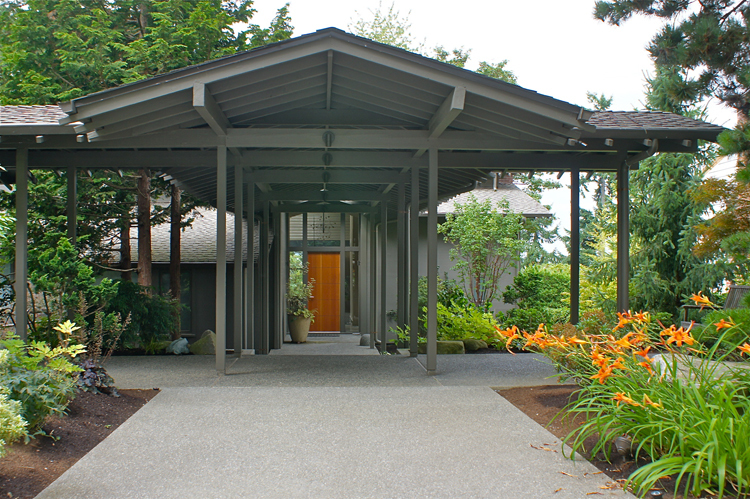 A covered garage rests on the grass underneath the building, and a concrete base offers glassy entrances into the home above. Exterior colors include muted greys and browns to blend with the windswept landscape. 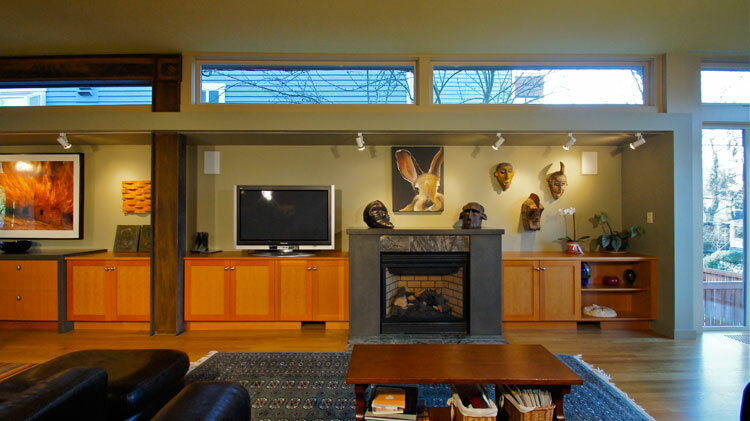 Large, west facing windows extend the view of Puget Sound across the length of the home. Owners and guests can regularly enjoy unobstructed sunset displays. This island remodel reuses the foundation of the original building, but with a few deft moves becomes an entirely new home. Adding a steep pitched roof grants breathability from the additional space and higher ceilings. 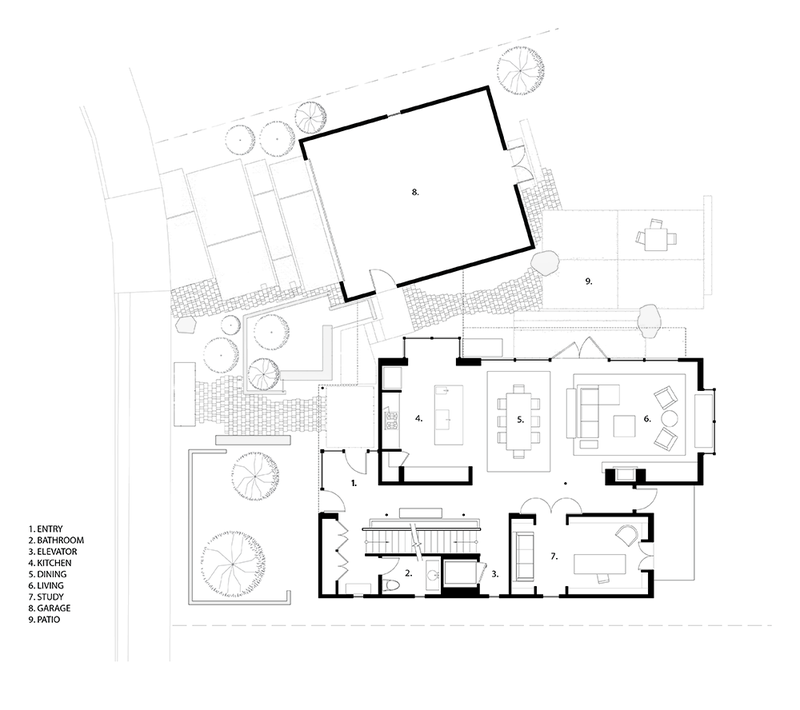 A family room and kitchen addition open the main floor into a free-flowing and connected space, with access to the terrace as well. A canopy over the patio creates a cozy setting for use in rainy weather, and blends the indoor and outdoor aspects of the home. This small guesthouse and garage was designed to compliment the existing craftsman home on its wooded site. The design gives visitors a delightful first impression of the home. A path connects the guesthouse to the main building, accentuating the lush surroundings and drawing attention to a colonnade and trellis. The interior of the guesthouse is one large room, featuring a bed alcove, kitchenette, study, and window seat. A large soaking tub opens into the living area of the suite when revealed by an elegant wood sliding door. 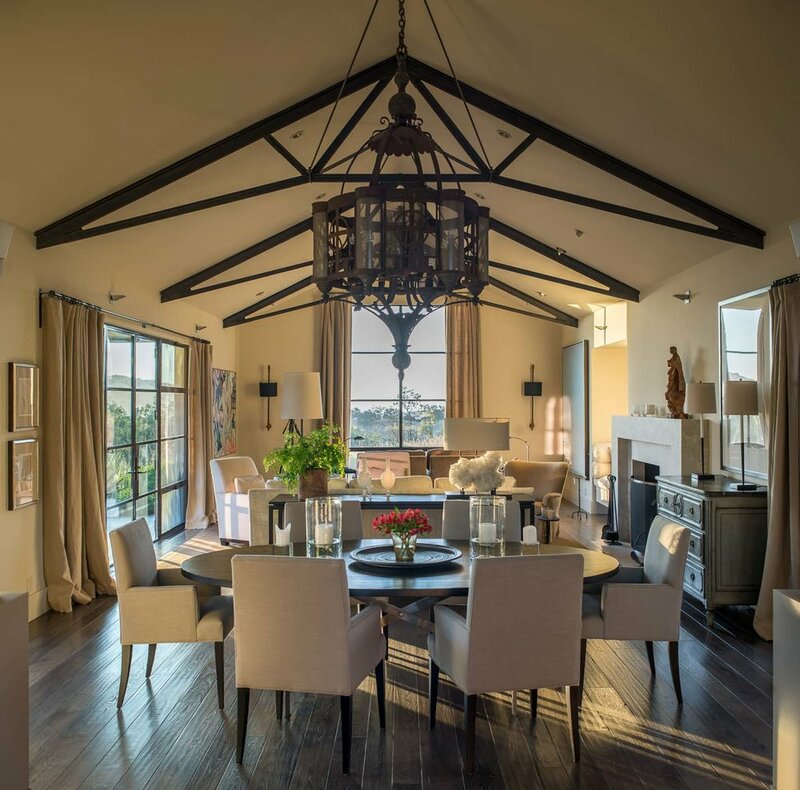 The exposed-beamed ceiling and carefully detailed interior grant a spacious yet intimate notion. This guest home is small enough to comply with guesthouse regulations but grand in feeling and luxury. Built on a narrow, undeveloped city lot, this bungalow's design provides functional comfort for a family with two active boys. 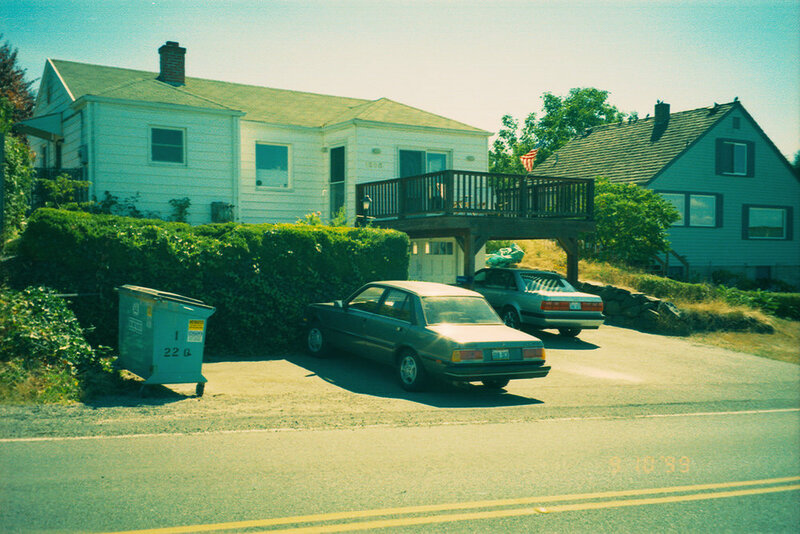 The plan utilized an existing garage at street level, breaking into a new basement from the back. 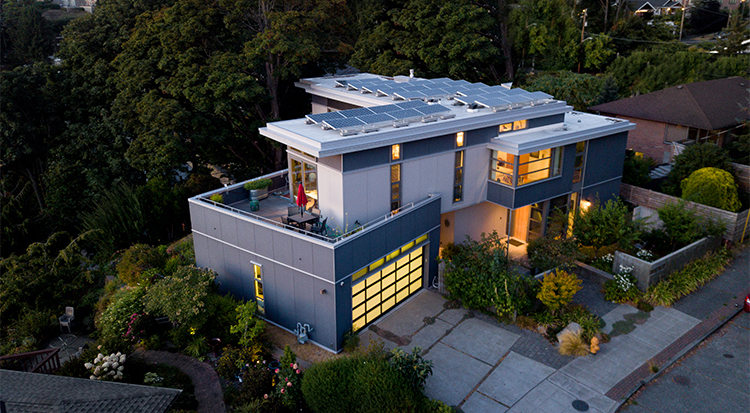 The living level utilizes the top of this garage as an extended outdoor terrace on the street side. The four-level home includes a master bedroom with centrally located bay window that overlooks the street side. Above, a craft and hobby attic room with views to the east and west, as well as operable skylights, provides a peaceful activity space for the children. On the main floor, the living area is extended onto a private terrace and yard for more secluded outdoor enjoyment. 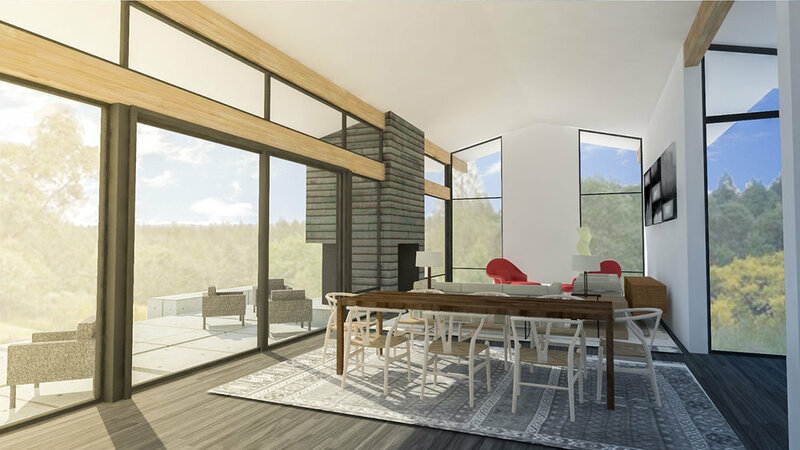 Set within a wooded lot overlooking Puget Sound, this new home features living area views to the water, and a sheltered terrace to the east. A master bedroom suite also captures an unobstructed view of the sound. A gradual slope blends the west terrace with the landscape. The recreation level below uses the existing slope to incorporate the building into the land as well. Soft exterior tones and the angled roof allow the design to complement the site. Tucked into the woods, the design of this Bainbridge Island residence centers on thoughtful placement of its structures between the old Douglas fir, hemlock, and cedar trees. The design evolved into a cross plan to take advantage of both a sunny clearing and forest to the north. The master bedroom with study below project into the treed canopy creating a romantic woodland experience. The family room and great room extend into the brighter sunny meadow, and a terrace connects the meadow with the home. 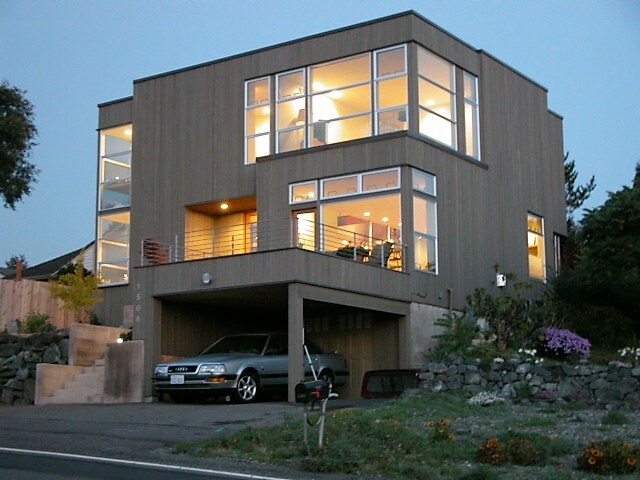 Broad overhangs, exposed beams and large windows display a northwest modern style. Beams, window trim, and windows are carefully detailed to interlace with each other and produce a tailored and integrated aesthetic. Taking inspiration from the landscape around Great Falls, Montana, the design for this home features a path that flows between two forms of the building and finishes on a built up terrace (the wash). The "wash" area protects the terrace and deck from the prevailing winds that follow the Missouri River to Great Falls. The deck on the upper level becomes a bridge between the house elements and extends past the building, adding an exciting prospect from the home and an overlook to the city. The upper floor houses the master bedroom suite and living areas, while the children's bedrooms and recreation room are below. An exterior terrace and lawn extend the lower level rooms to the outdoors. 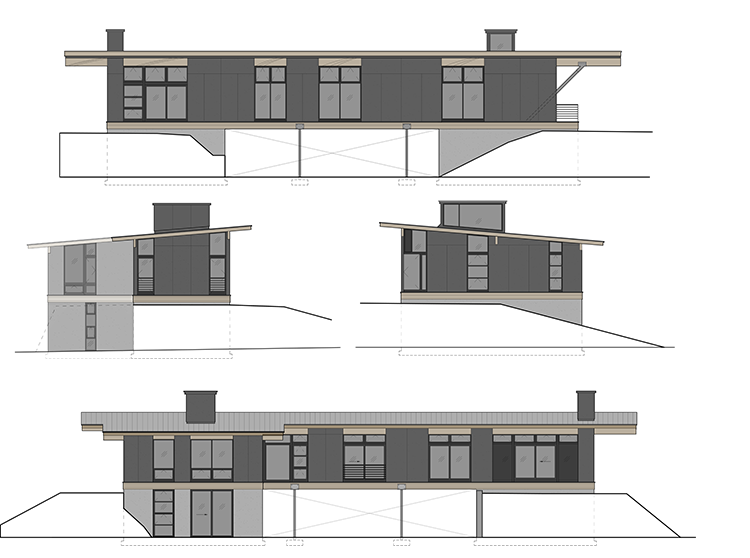 The roofs of the home flow downhill with the slope of the land and provide generous overhangs. 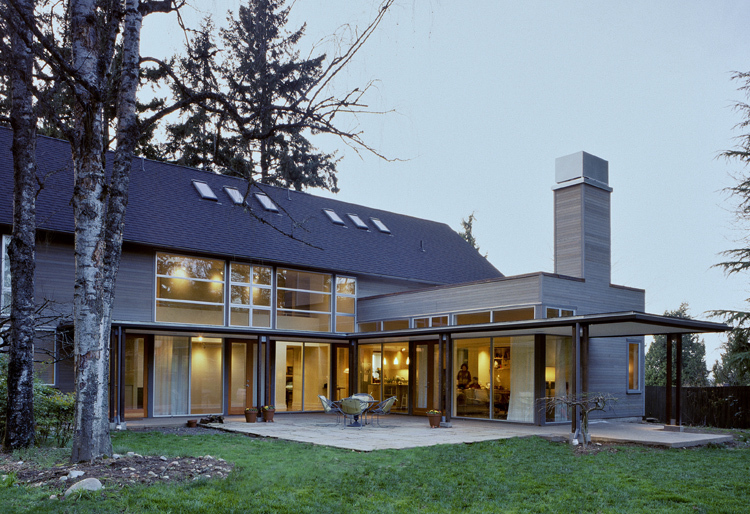 Large beams extend out to carry each roof and help reinforce the horizontal line of the house. This modern residence was built on the foundation and floor framing of an existing postwar home that was too small for a growing family. 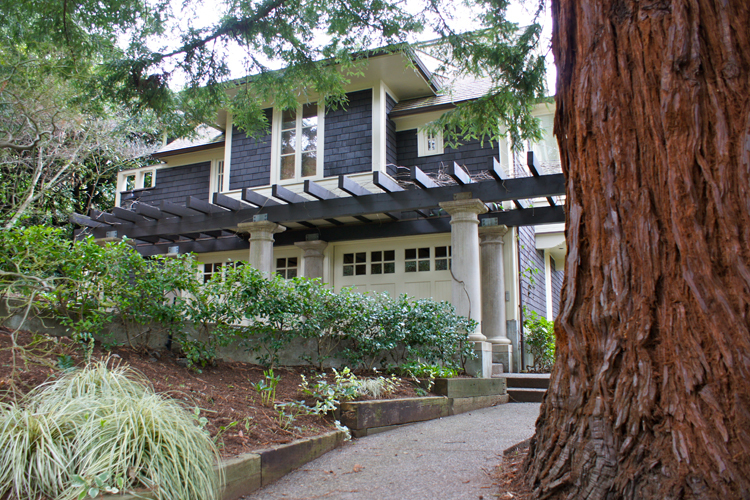 A new second floor added several bedrooms and bathrooms, each with large window views of the surrounding evergreens. 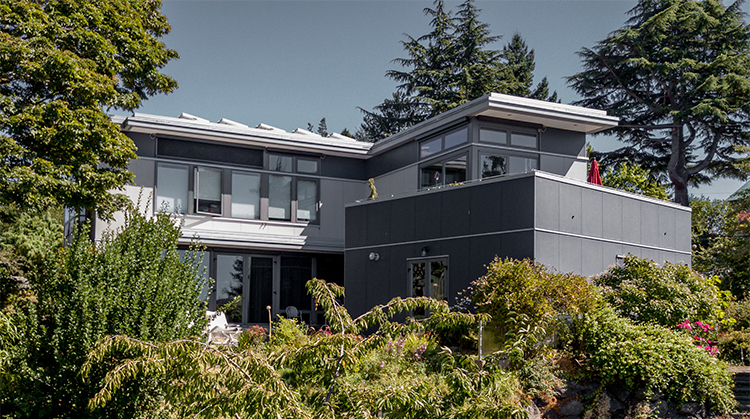 Innovative use of cement board panels and aluminum trim combined with shingles give the home a unique modern edge. Subdued colors and use of vertical space allow the home a comfortable fit in a neighborhood that is densely built, while still retaining trees and yard space. The interior of this 21st century home is both spare and striking. Exposed framing in line with the windows creates a dramatic ceiling for minimal cost. The second floor hallway is a wooded deck dropped onto steel angles between the two solid elements of the house’s upper floor. Cantilevering the upper floor over the existing driveway helped expand the home while maintaining a backyard garage and driveway.